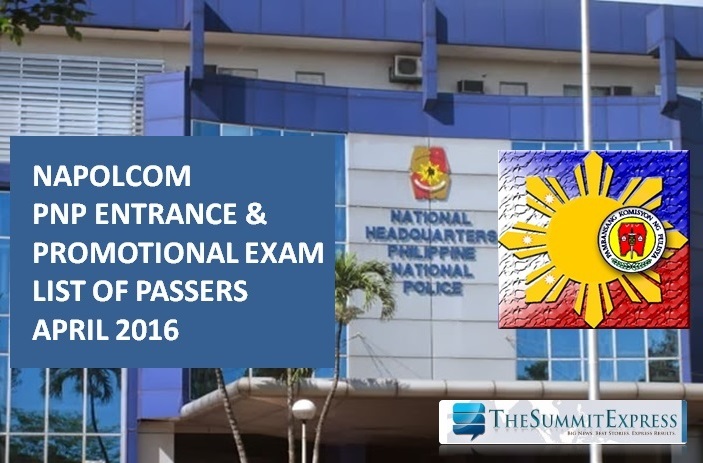 Those awaiting results of April 24, 2016 National Police Commission (NAPOLCOM) exam for the Philippine National Police (PNP) entrance and promotional examinations can find here the complete list of passers and top 20 as the commission officially released results on Friday, June 24. NAPOLCOM administered the PNP entrace and promotional exam to a total of 42,848 examinees in designated testing centers nationwide. Interior and Local Government Secretary and NAPOLCOM Chairman Mel Senen S. Sarmiento said that 23,175 tried to hurdle the PNP entrance exam while 19,673 were distributed to the various promotional test categories which include Superintendent, Police Inspector, Senior Police Officer and Police Officer exam. The three-hour entrance examination for PNP entrance covered questions on general information, verbal reasoning, quantitative reasoning and logical reasoning; while the promotional examinations include general information, police administration and operations, and police customs and tradition/values and ethical standards. The expected release of April 2016 NAPOLCOM exam results is after 2-3 months or anytime in June to July 2016. On April 26, 2015 examinations, results out online in more than 2 months or on July 7. Promotional police exams posted the highest passing rate in 24 years as 11,077 out of 21,650 or 51.16% of the examinees passed the tests. In the PNP entrance examination, a requirement for initial appointment to the rank of Police Officer 1 (PO1), only 2,110 or 16.33% of the 12,923 examinees passed. Meanwhile, the results of October 2015 NAPOLCOM exam were released in more than two months after the test. A total of 2,600 out of 14,860 examinees successfully hurdled the PNP entrance exam. Like Us on Facebook or Follow us on Twitter to receive updates.